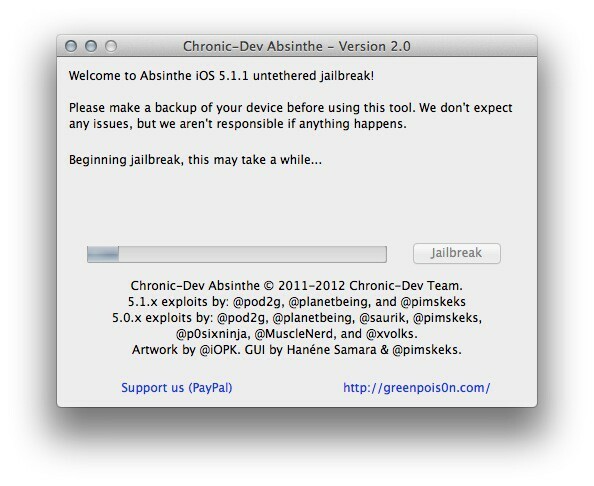 The Chronic Dev Team has pushed out a minor update to its Absinthe 2.0 untethered jailbreak. The tool was only released this morning, but this new update addresses issues where the software can freeze up during the process of jailbreaking. If you’re having trouble jailbreaking your iOS device on iOS 5.1.1 with Absinthe, grab this update now. AMSTERDAM, THE NETHERLANDS – 25th May 2012 – Today @pod2g and the @ChronicDevTeam announced the highly anticipated release of Absinthe 2.0 at #HITB2012AMS held at the Okura Hotel in Amsterdam. Known as the “iOS Jailbreak Dream Team”, @p0sixninja, @pod2g, @planetbeing, @pimskeks released the untethered jailbreak for iOS 5.1.1 on the final day of the week-long conference. Echoing Steve Jobs’ trademark WWDC encore of ‘… and one more thing’, the team announced the release of Absinthe 2.0 during the closing minutes of their 2 hours talk at the conference. Absinthe 2.0 will affect the majority of Apple devices running iOS 5.1.1 including iPad 1,1 – 2,1 – 2,2 – 2,3 – 3,1 – 3,2 – 3,3, the iPhone 2,1 – 3,1 – 3,3 – 4,1 and iPod 3,1 – 4,1. The jailbreak does not support the third generation Apple TV and support for iPad 2,4 will be added at a later date. The release announcement came after recent rife speculation spreading through online social networks on the actual release date and scope of Absinthe 2.0. The jailbreak community’s interest was first piqued when the team announced they were scheduled to appear at HITBSecConf2012 – Amsterdam to deliver not one but two talks covering both the Corona (A4) and Absinthe (A5) jailbreaks for Apple devices. On the 20th of May, a tweet from team member @pod2g stating the release of Absinthe 2.0 was ‘in a matter of days’ led to further speculation that the final release would be made at HITBSecConf which ran from 21 – 25 May. “This was certainly one of the most highly anticipated talks we’ve EVER had at one of our HITB conferences, and we’ve done quite a few of these. The excitement from the Dream Team followers and overall Twitter and online buzz has been terrific!”, said Dhillon Andrew Kannabhiran, Founder and CEO of Hack In The Box. “It was truly an honor to host the Dream Team in their first ever ‘real world’ meet up and we would like to thank them for taking the time and effort to make the trip over to not only join us at our third European outing, but to help kick-start our celebration of ’10 years of HITB awesomeness’ with the release of Absinthe 2.0!”, he added. About iOS Jailbreak Dream Team: The group is made up of members from the Chronic-Dev Team and the iPhone Dev Team and consists of @MuscleNerd @pod2g @planetbeing @p0sixninja @pimskeks. About iOS jailbreaking: iOS jailbreaking, or simply jailbreaking, is the process of removing the limitations imposed by Apple on devices running the iOS operating system through use of custom security exploits. Jailbreaking allows users to gain elevated access to the operating system. Consequently it also allows users to download additional applications, extensions and themes that are unavailable through the official Apple App Store.